Dont Let Your Black Friday Bargain Be a Counterfeit! Friday 23rd November is Black Friday which means one thing, Christmas shopping galore! Also a cheeky present for yourself possibly? Though if like myself you want to get a good deal but also want to avoid the Black Friday madness in the shops, online shopping is the best way to go. However, what if an electrical item you order online turns out to be counterfeit, faulty, or even possibly deadly? Research conducted by Electrical Safety First found that nearly 1/3 of people in the UK have become victim to counterfeit scams when doing online shopping, that’s around 18 million people! Furthermore, they also found that 1 in 7 Brits have experienced loss or serious damage from an electrical item which they purchased online. 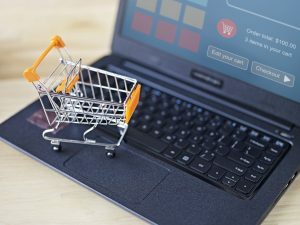 What should you look out for when buying electrical items online? If the price seems to good to be true, it probably is! Fake items are likely to be sold at a cheaper price than the high street value. Don’t always believe seller and buyer reviews! Some reviews could be fake, especially if the reviewer isn’t verified. Be aware of where a supplier is based. Fake products produced overseas are likely to not have undergone safety tests. We always suggest buying from recommended retailers. If a seller states their item is ‘real’ or ‘genuine’ there is a good chance it isn’t either of those things. A reputable retailer does not need to sell their products like this. Always look out for the padlock symbol when filling in your payment details online. It would be wise not to make payments on websites without this symbol. We also recommend PayPal as a safer way to pay as they provide buyer protection on purchases. What are the tell tale signs of a fake item? A legit electrical item will always have a safety certification on its label. Ensure the item you purchased has the certification on both the packaging AND the product itself. If you purchased the item in the UK, double check that the electrical item comes with the three-pin UK plug and charger. Is the packaging of a good quality? Check the packaging material is of a good standard and there is no grammatical errors or spelling mistakes. A legitimate electrical item should come with all the parts, a manual, or a product registration card. On arrival of the item it is important to thoroughly inspect both the packaging and the electrical item itself. Taking all the above into consideration, it should be fairly easy to spot a counterfeit product. If you’re still not sure, do not initially use the item and spot check it against the same item bought off the high street. So it turns out you have bought a fake item, now what? You will have a legal right to a refund. However as mentioned above, it is always recommended that you pay via PayPal or Credit Card for that added protection. If the seller refuses to give you a refund, then go above them and contact the company in which they are selling through e.g. eBay or Amazon. Leave accurate feedback to help alert future shoppers. Report your faulty item to Trading Standards so that they can take action against the seller. If you have any stories about counterfeit electrical items we would love to hear from you! Or if a faulty item causes you any electrical problems in London & Hertfordshire then please do contact us HERE. Dont overload your extension lead or wall socket this winter! Now that the chilly weather is definitely upon us, thoughts are now turning to how we can keep warm over the Winter. Sometimes our heating needs a boost and the electric blankets and electric heaters start to make a return appearance once again. Despite all this, it is mindful that a household electrical system is only designed to cope with so much. 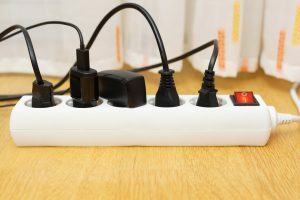 Unfortunately increasing numbers of households are overusing extension leads and in some cases actually overloading them with the wrong types of appliances. What appliances could overload an extension lead? It is actually smaller appliances such as kettles, toasters, and hair dryers which actually consume far more power than what you might imagine. In fact it is recommended that kettles and toasters actually have their own socket and are not used on extension leads at all. This is because a kettle alone would use the maximum electrical load on a 13 Amp extension lead which renders the rest of the extension lead useless! Electric heaters can provide a great way of providing quick and effective heat into winter chilled rooms, they are great in a living room when plugged into an extension lead along with a laptop, printer and a router but be wary of using them with a hair dryer. An electric heater and a hair dryer plugged into a 13 Amp extension lead will overload it leading to risk of overheating and fire. As a general rule, no more than 3000 Watts of energy should be plugged into a 13 Amp extension lead. Of course we don’t expect you to calculate how much energy each appliance uses, just be mindful of more power hungry appliances such as kettles, hair dryers and electric heaters which should ideally have their own socket for your own peace of mind. What appliances will be ok to plug into an extension lead? Appliances which consume less power will be better used in an extension lead. 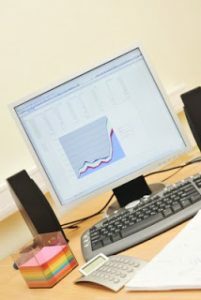 Such appliances include televisions, computer monitors, hard drives, laptops, wireless routers, mobile phone chargers, and games consoles etc. Even items which you would imagine might use more power such as electric blankets and hair straighteners are ok to use in an extension lead. However before you plug in, it is important to check the Amps on your extension lead. We have based our post today on a 13 Amp extension lead. The capabilities of a lower Amp extension lead (like a 5Amp) will be much lower. Where are extension leads suitable for use? 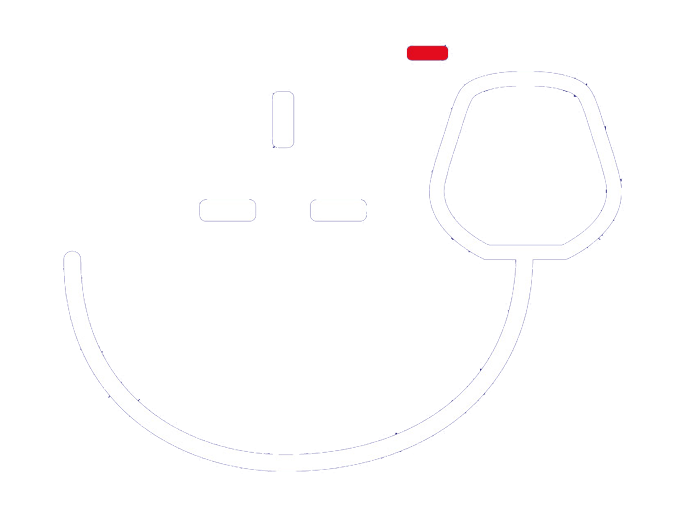 We recommend that extension leads are restricted to living areas and bedrooms within your home. In kitchens, appliances such as washing machines, tumble dryers and dishwashers would cause a 13 Amp extension lead to overload if more than once appliance was used at the same time. Of course extension leads should never be brought into bathrooms and WC areas in your home. In an ideal world, extension sockets should not be used at all. To maintain optimum safety levels in your home, you would plug each appliance into it’s own socket, however we do understand that in living rooms in particular it would not be practical to have a socket for every single thing! In rooms such as kitchens, it is a good idea to ask a domestic electrician in your area to install extra sockets if you are finding it difficult to manage with what you have. In recent years, there has been increasing demand for additional kitchen sockets, and here at Fulcher Edwards we are often asked to fit additional sockets into our clients home. The installation of additional sockets should always be done by an electrical contractor who will ensure that they are safely installed and tested for your peace of mind. A good time to consider your household needs for extra sockets is when you carry out home improvements in London and Hertfordshire. Redecorating a home often leads to replacement sockets for something more fitting with the theme. It is a great idea to ask your electrician to install additional sockets if you’re using extension leads currently. In fact all good NICEIC electricians in St Albans will ask you about your current electrical needs to ensure that you have enough electrical sockets. Give us a call now on: 020 7922 1101 / 01923 616985 or send us a message HERE. Most of us wish we had the option to work from home in London and Hertfordshire from time to time, well I do anyway. The thought of being able to roll out of bed a little later, to have a leisurely breakfast, hey maybe cook myself some scrambled eggs on toast and then casually turn on my laptop in my PJ’s, all in the privacy of my own home sounds oh so great to me! For those of you that do have that privilege of working at home, the team at Fulcher Edwards, your local, reliable and trustworthy Electricians in London and Hertfordshire, wondered how many homeworkers with electrical equipment provided by there employers, have some type of electrical maintenance in place or if there just left to get on with things? You know the ‘well it works’ attitude that some companies tend to suffer with unfortunately. Although the home is the responsibility of the homeworker, they are only actually responsible for their own equipment which is purchased by themselves. The Health and Safety at Work Act 1974 (HSWA) places duties on employers, self-employed people and employees. Under this law employers have a duty to protect the health, safety and welfare of their employees, this also includes homeworkers. The safe use of electricity at work is covered by the Electricity At Work Regulations 1989. Although homeworkers have a slightly different set up, their safety is equally as important as workers in an office environment and electrical maintenance needs to be in place regarding their equipment such as portable appliance testing. The type of maintenance procedures employers have in place will depend on whether hazards are low or high risk. If you work from home then why not speak with your employer about what procedures are in place? As maintaining your electrical equipment is important for a number of reasons, mainly to avoid electrical faults as they can cause a fire. If you are a homeworker in London or Hertfordshire, as professional electricians in London and Hertfordshire, we would love to hear what electrical safety procedures your employer has in place? Halloween is the season to be scary and each year it is turning into a bigger event in this country, so why not get into the spirit of things by adding some spooky lighting to your own haunted house! 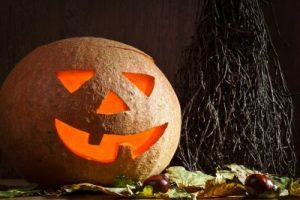 There is some great spooky figurines and lighting ideas to be found on the Internet in preparation for Halloween that we have shared with you below, but it is still important to consider electrical safety when purchasing and decorating your home for Halloween to keep your trick or treater safe. Add some dark & spooky scenes to your pathway by using floodlights as they cover a large area with colored light. The right color sets the mood for your display, so plan the look you want and choose accordingly. Blue floodlights add to the ghostly feel of a graveyard scene, while red lights enhance a naughty devil theme. Purple lights and red lights can also help set the mood for a vampire setting. Green lights bring a spooky-faced witch to life. Floodlights get very hot, so make sure they are set up safely away from children, pets and combustible material like dry leaves with no cables causing a trip hazard. It is important that any light you use outside are approved for outdoor use so always check before buying. As recommend on lights4fun why not add novelty cobwebs to your Halloween displays, however keep them safe and choose only LED, low voltage or battery powered fairy lights. Don’t use candles in your pumpkin this year and put yourself at risk of a fire hazard, use battery operated tea lights instead. The beauty of battery operated LED candles is that you have the safety of a no naked flame, no fire risk, but a realistic animated effect. LED Tea Lights will never get hot and are perfect around home decorations, fabrics and furniture. Perfect around children and no re-lighting flames when the pumpkin is on the door step!We loved these at lights4fun. If you need to use an extension lead when decorating your haunted house remember not to overload the circuit by plugging to many lights into it. This can cause the wiring to overheat which can be a potential fire hazard, instead spread the lighting load over different circuits or lessen the lighting load. Replace any cords that are frayed or show signs of wear, and avoid a trip hazard by keeping them out of the way of where people will be walking. Rain and ground moisture can affect their operation and could cause a dangerous situation as electricity and water do not mix, so keep them inside. Always roll your extension lead completely out and never leave it partly on the coil otherwise it could suffer heat damage. Always turn off your lighting displays when your haunted evening is finished as a short circuit could easily cause a fire. Always make sure that any portable electrical equipment that is used in the garden are protected with an RCD. If your electricity ends up playing tricks on you this Halloween, please do not hesitate to contact us! Many household electrical appliances have the potential to cause serious burns and with the nights (and occasional days) suddenly having turned chillier, householders are now reaching for additional sources of heat. Electrical items such as fan heaters, electric blankets, not to mention the usual suspects like irons, kettles and hair straighteners all have the potential to cause serious burns. It is bad enough receiving a burn as an adult but children suffer the worst from burns due to their skin being a lot thinner than that of an adult. In fact, hair straighteners misuse accounts for one tenth of overall child related burns in the UK. Heated electrical appliances present a particular risk to children as they can often be mistaken as toys. The bright colours of hair straighteners, the moving components of electric heaters, pull cords and long cables all present a problem. A Childs fingers can become stuck in the grills of electric heaters causing severe burns and all this can happen even if you are watching your children. All parents will know where we’re coming from on this! Over the past week we have spotted several ‘burning problems’ in households where we’ve been carrying out electrical work. -Open fires left without any form of fire guard with a young child running about. -An iron left to cool down unattended in a kitchen. A child could have easily grabbed the cord or switched it back on. -Hair straighteners left switched on accidentally whilst the householder was out at work. 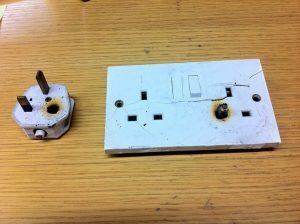 As electricians in Hertfordshire, we have unfortunately seen many instances over the years where electrical accidents and burns could have been easily avoided. It takes seconds for a nasty electrical burn to occur and years sometimes to try and sort it out afterwards. One of the easiest ways to keep electrical appliances safer is to switch off and unplug when not in use. It is all too easy to leave appliances switched on after using them, but remember most burns occur from unattended appliances. Hair straighteners make up a large proportion of household burns so why not consider a using a heat pouch? Not only will this protect against burns but will also stop damage occurring to surfaces from the heat and also fire. It is always awkward to know where to place hot straighteners after use, a heat pouch is a safe and easy option. We know for sure that two leading hair straightener manufacturers provide heat proof pouches as standard with their products. . The last thing you need is your electrical appliance malfunctioning when it’s in use, so keep a close check on what’s going on with your electrics. Signs that you need to call an electrician are singe marks on sockets, warm sockets after use, discolouration or hairline cracks on sockets, buzzing noises or odours coming from the socket or sparks when you switch it on or off. These are the main problems, there are more, so if you have any doubt about the safety of your electrics do not leave it to chance and call a qualified and registered electrician as soon as possible. As electricians in Hertfordshire, we carry out electrical work across many homes including privately owned and rented properties and businesses such as letting agents. Electrical fires are one of the main causes of fire starting in the home and very often the fire is caused by something that could have been prevented if fixed by the home owners. It’s not just home holders that need to avoid electrical fires, it is business owners too. The same electrical recommendations apply whether in the home or work place. There are two main components to electricity – that is the wiring itself in the property and electrical appliances. If either (or both) of these are defective, then the risk of fire is of course far greater. To keep yourself, family and colleagues safe you need to look out for a few simple indicators, as well as follow a few common sense procedures to avoid an electrical fire. Here at Fulcher Edwards we have vast experience in dealing with fire safety and not only do we offer a wide range of electrical services in Hertfordshire and London, we can also advise on fire safety both in the home and business. 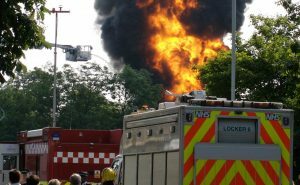 We can also provide a workplace fire training course. Some of these recommendation may seem obvious but it is not uncommon for us to visit properties and business premises and find electric heaters in bathrooms, towels covering electric heaters, and multiple adapters in plug sockets. Quite often, the householder is aware of the risk they are taking and because they haven’t yet experienced a fire assume that all is safe. It can take some time for a fire to occur, it doesn’t have to happen straight away! Turn off and unplug all electrical appliances when you are not using them except those that are meant to be permanently switched on (like the fridge or DVD recorder). Use only one plug in each socket. If you have to use an adapter, use a fused ‘in line’ type. Avoid multi-way adapters and overloading electric sockets by using several adapters as they may overheat. Don’t run leads or cables under carpets or rugs – you won’t be able to see if they become damaged. Check for signs of loose wiring and faulty plugs or sockets (such as scorch marks or flickering lights) and have any problems you find fixed by an electrician. Replace worn, damaged or taped up leads and cables. Always use a proper ironing board and turn off the iron after use. Make sure the iron is left to cool on a heat resistant surface away from curtains, carpets and anything else that may catch fire. Always switch off hair straighteners/curling tongs after use and leave to cool on a heat resistant surface away from curtains, carpets and anything else that can catch fire. Checking regularly for faults with wiring and electrical appliances can help avoid an electrical fire. Electrical fires have caused devastation to homes and businesses across the UK as well as claimed lives. A few minutes of being vigilant on a daily basis could save your life. Electrical Safety First also have a great system on their website in which you can check if any of your home appliances or electrical equipment have been recalled. A product will be recalled by the manufacturer if it is deemed not to be safe, and therefore increase the chance electrical fires. It is also a good idea to register your new appliances as that will enable the manufacturer to easily get in touch with you if your product is being recalled. You can register your appliances here! Workplace lighting got you feeling blue? If you are a business owner, you will already be aware of the importance of the correct lighting requirements in the workplace. Incorrect lighting has been the cause of many serious accidents in the workplace – in a production environment, it can cause obscurity of vision – an example of this would be a machine could appear stopped when in fact it is still moving. Poor lighting in an office environment can lead to eye strain, fatigue and uncooperative staff. Staff working in front of screens all day need the correct lighting to ensure they do not endure health problems. When considering lighting, it is important to think about the type of work that is going to be carried out – will it be close, accurate work or will it be for more general purposes such as corridor lighting? To ensure the right type of lighting will be installed in your business, consideration must be given to colour, glare, and contrast amongst many other factors. This is why it is important to use a qualified electrician to design and install your lighting requirements in your business. Fulcher Edwards are lighting designers and installers in Hertfordshire and have been taking care of the lighting in many businesses over the last 37 years. Deciding on the correct lighting in the workplace can seem like a technical and difficult task – this is why it is better to leave it to an electrician who understands the workplace lighting regulations and who can work with you to develop a great cost effective lighting solution for your business premises. Recent studies carried out by the Health and Safety Executive have shown that employees like to control their own lighting and this increases job satisfaction and decrease stress in the workplace. For more information about lighting in the workplace including the problems associated with having inadequate lighting take a look here! What Would You Do In The Case of a Fire? 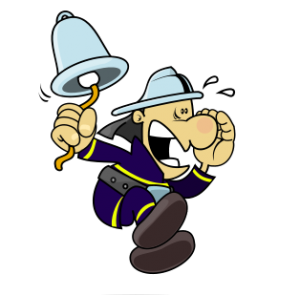 Would you a) Be alerted by your smoke alarm? b) I guess my smoke alarm would alert me but I don’t test it, or c) What smoke alarm, do I need one? Does this scenario seem a bit daft? It will if you have smoke alarms fitted in your home and you test them on a weekly basis – if this is you – then you are in the MINORITY of people who have a smoke alarm in their home AND test it regularly. If you are a landlord or business – are you staying legal? The Regulatory Reform Fire Safety Order 2005 (FSO) is the primary legislation for all non-domestic premises in England and Wales, including the common parts of blocks of flats and houses in multiple occupation (HMOs). Failure to comply with the FSO is an offence punishable by hefty fines or imprisonment. So where do you start particularly if you are a new landlord? The good news is that you are in safe hands with Fulcher Edwards. We can take care of the whole fire safety requirements and legalities of your rental properties and business premises in London and Hertfordshire. We don’t come and install whats needed and then leave, we design each system for every client to ensure its effectiveness in the event of fire. It is then installed by an expert team of compliant, qualifed electricians to current British Standards and then tested. This is all part of our standard service. Our service does not end here……we also offer maintenance services – you can rely on Fulcher Edwards to not only install your fire system, but to also maintain it – we’re proud to continue to put our name to our installations long after the first install. We also provide fire warden training as well as fire extinguisher installation and maintenance. We have many clients in London and Hertfordshire, both big and small – and our guranteed high standard of work is ensured across each and every installation whatever the size. We also work with many domestic customers who are keen to ensure their home safety. Fire safety goes much further than a cheap battery alarm, give us a call to discuss your requirements – Fulcher Edwards can install a great fire safety package in your own home – without all the annoying beeps that keep you up all night. You will also find information about the complimentary services offered by Fulcher Edwards including emergency lighting services. Don’t compromise your safety – choose Fulcher Edwards for all your fire needs. A week rarely goes by without the team at Fulcher Edwards being slightly concerned by the lack of interest some companies have in maintaining there Emergency Lighting in their building, yet it plays such a major part should an emergency like a power failure occur. Though some companies will happily take our advice as they were not aware of there full responsibilities before, some do just push it to one side. The British Standards (BS5266) recommends that emergency lighting systems be regularly serviced by ‘competent’ persons, which means these being persons with the necessary knowledge, skills and training to undertake emergency lighting servicing procedures. 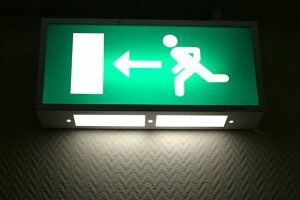 The Purpose of Emergency Lighting? Regular testing in your premises ensures that your emergency lighting system remains reliable at all times and should an emergency occur then this type of lighting ensures that people can evacuate a building safely. This requires a visual check to ensure that emergency lighting systems are operating correctly and that indicators are working. This should be carried out by the ‘responsible person’ delegated by a company. Any faults should be logged and corrected ASAP. All luminaries should be checked for signs of damage or disrepair. All emergency lights should be briefly tested to ensure that they operate in the event of mains electricity supply failure. This will usually be carried out by the ‘responsible person’. Again any faults should be logged and corrected ASAP. A full 3 hour system inspection and duration test of the emergency lights should be performed by a ‘competent person’ who will log the details, rectify any faults and provide your company with certification for your fire safety records. This is a person who has the necessary skills, training and knowledge to perform emergency lighting maintenance and servicing. They are qualified, experienced in emergency lighting, registered with a government approved body(such as NICEIC) and comply with the British Standards. Your chosen electrical services company or electrician will also be able to advise if all lighting and exit signs are up to date with current legislation and are adequate for the purpose intended. This is a designated member of staff in a company who can quickly and easily perform monthly checks and record information in a log book. They also need to be punctual with their tests each month and report any faults immediately to the chosen company who manage your emergency lighting system. Maintaining your emergency lighting and arranging regular testing in your company, ensures your emergency lighting remains fully functional during an emergency where an electrical failure may occur, lights up exit routes and signs for the specified duration. We maintain emergency lighting for a number of commercial clients in Herts and London as well as charities, landlord’s properties, rail depots, shops, restaurants & bars. Our aim with this blog post is to make businesses aware of how important it is to maintain their emergency lighting. It plays such an important role for people entering your premises who are unaware of the layout during an emergency; it really could be a lifesaver!